This vertical cast iron dial is a rectangle approximately 30x40 inches mounted on a pole. 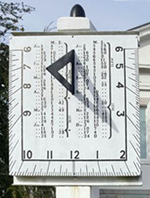 The Barnwell sundial was a gift to the city in Sept 1858 from state senator J.D. Allen, and has continuously shown civil time - accurate to within two minutes - for over 150 years. The vertical dial has an Equation of Time list of corrections for each week, giving the correction in minutes and seconds. A canon ball from the civil war sits atop the sundial. The dial is surrounded by a low circular wall with bronze statuary of a boy walking on the wall and a girl at some distance, looking at the dial. A 20 foot stone monument with a 2 foot diameter vertical recliner dial. See the NASS Compendium Vol.6 No. 1 Dec 1998. The platform in the base includes stones from the thirty-eight home states of those lost. Imbedded in the in the platform is a bronze arrow, pointing to the unmarked grave in the Atlantic. ca 20' Bronze Spherical bronze sundial consisting of three intersecting circles supporting an arrow shaped gnomon. Open mouthed gargoyles surround the column's highly carved capital atop a white octagonal column 33 inches high. This graceful 10 foot bronze sundial is a model of Paul Manship's dial "Time and Fates of Man" made for the 1939 New York World's Fair. The 1939 dial was made of plaster and stood 80 feet tall, claiming to be the biggest sundial in the world. This bronze armillary titled "Cycle of Life"is one of several by Paul Manship in the 20's. The equatorial band has Roman hour numbers on the inside and ornate signs of the zodiac on the outside. Also on the dial are the four elements of earth, fire, water, and air. In the center are three figures of a man, woman, and child symbolizing the cycle of life.